The CS-80V is the reproduction of the legendary Yamaha® CS-80, which is considered by many as the "ultimate polyphonic synthesizer". The synthesizer is based on TAE®, (True Analog Emulation) the proprietary technology developed by Arturia, dedicated to the digital reproduction of analog circuits, and already used in the Moog Modular V.
Typical original CS-80 saw-tooth wave form which clearly shows a 30 µs pulse at the top of the edge. Look at the waveforms captured from a real CS-80 compared to our CS-80 V.
The about windows shows new independent voice tuning knobs. They can be used to trim the tuning of each card on the CS-80V independently of the presets settings. New controls for enabling/disabling pop-up windows. Ring Modulator : Closer to the original behavior with a new On/Off switch to save CPU. 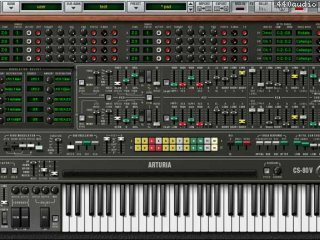 Chorus/Tremolo : The algorithm of the Chorus/Tremolo was completely revisited and much improved to get closer to the original large and fat sound of the CS-80 . Ribbon controler : The GUI's ribbon controller works now exactly as the original does. As its model, it doesn't change the pitch when the notes are releasing for more musical applications. Effect routing : The new routing algorithm of the effects fixes some issues of the previous version. CS-80 V Original Presets : The original presets have been redesigned. A special thanks goes to Max Fazio for his assistance. Modulation matrix: The keyboard-follow has been added in the modulation sources available. Copy and paste "singles" from one preset to another: it is now possible to select one "single" in any existing preset and paste it directly in another preset. This is particularly useful for creating rich multi-timbral presets efficiently. Polyphony (In the Multi-Mode setup): On each 8 single voices, possibility to manage from 1 to 4 polyphonic voices. For multi-timbral 8 "single", the polyphony is not limited to 1 voice, but to 4. Ribbon controller: Following different requests, the Ribbon controller now offers the exact same behavior as the original. A linear variation of the oscillators' frequency is possible, while the first mouse-click sets a relative position as a starting point. Ability to set up the plugin in multi audio output. In the "Multi Mode setup", the host sequencer will recognize 10 outputs instead of 2: the 8 "single" outputs and the 2 master outputs. Audio Unit:compatibility with the latest versions of Audio Unit and Logic Audio. For ProTools: the management of the tempo synchronization was not working correctly in all configurations. This problem has now been corrected. Arpeggiator: the synchronization of the MIDI tempo from the host application was, in some cases, not responding correctly. Guess what? This is not the case any more. Oscillator:it was not possible to set the pulse width of the second oscillator on the previous version. This is now possible. There was a bug on the set-up of the parameters when closing the "Multi Mode" setup. This bug has now been now corrected. Ring modulator: the ring modulator was only playing on the left voice. It now plays on both voices. This is the most wonderful sounding software on the market, and the best emulation of any hardware vintagesynth. The sound is fat but in the same time so silk smooth and thin. If you ever heard Vangelis and like his sound, you are in heaven with this softwware. He is known to use the mighty Yamaha CS-80 in almost every record he has made. It is hard on your computer (processor hungry)so if you do not have a G5, maby you only can use a few instances of Cs-80v? My only wich is a hardware interface like the real thing with knobs and faders on it. Firmware. 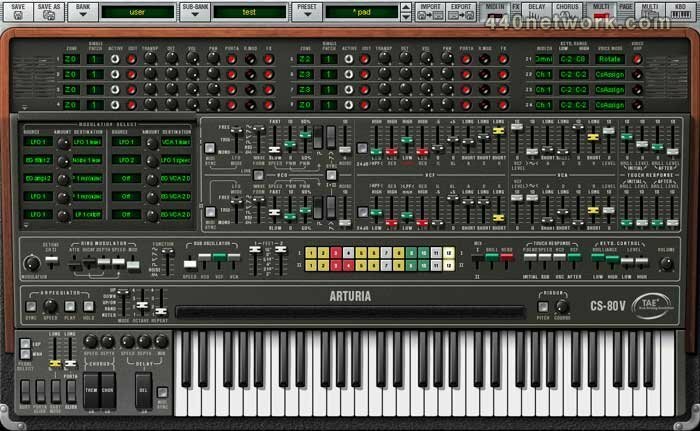 Firmware for the first hardware synth from Arturio : the Origin.